This very easy necklace is the one that I made when I had very limited tools. The pearl-amethyst necklace came out quite pretty and I got a lot of compliment on it. 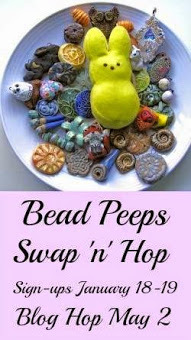 If you are a beginner beader you may like to try this pattern. * 1 string of 2mm size rice pearls with light pink shade of which I used about 90. * 1 16" 3-4mm faceted amethyst gemstone beads (from Fire Mountain) of which I used 20 beads. 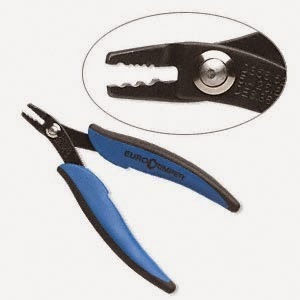 Chain-nose plier and wire cutter (diagonal flush cutter) and one set of Crimp pliers. 1. Cut 24" of beading wire. My finished necklace is 16". Cut more or less if you want to modify the length. 2. Take one end of the wire and one of the two components of the toggle clasp. 3. Let the wire go through the loop of the toggle clasp component. 4. String a crimp bead and then a silver bead. 5. Tighten the short end of the wire that has gone through the loop , the crimp bead and the silver bead. 6. Now crimp the bead. And put a crimp cover if you want. 7. String an amethyst gemstone bead and three rice pearls. If your beads let both parts of the wire go through their holes, very good, if not this is when you have to cut the short end of the wire with your wire cutter. 8. String the pearls and the amethyst beads maintaining the pattern of one amethyst bead, 3 pearls, one amethyst bead, 3 pearls .. until you have 10 amethyst beads in your pattern. Here you may repeat more if you want to make the necklace longer or repeat the pattern fewer times if you want it shorter. 9. After you have 10 amethyst and 30 pearls string one more pearl, an amethyst tear drop, another pearl and one sea opal briolette. 10. Repeat the pattern of one pearl. one amethyst teardrop, one pearl and one sea opal briolette for 14 times so that you have 14 sea opals. Finish with one pearl, one amethyst tear drop and four pearls. 11. Repeat the pattern you had before introducing the sea opals.That is: one amethyst, three pearls, one amethyst, three pearls... until the length is equal to the other side. 12.End with one silver bead, one crimp bead. Let the beading wire go through the loop of the other toggle clasp component.
. Pull the thread so that there is no gap. Now crimp the crimp bead.Cut the excess wire with your wire cutter. Amethyst makes one gentle and amiable. It brings good luck. It is believed that pearl brings good luck too and love. 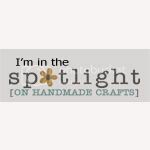 As I write this I visualize you making this necklace and finally wearing it or giving it to your loved ones. Please drop me a comment so that I know your presence and get a chance to know you. Your feed back is important to me. With all the best- Dita. How nice of you to share your project?! Love those fire opal stones! Thanks for sharing! Nice to see such beaded jewelry pattern. its a new pattern which i had newer seen before. Thank you for sharing such beautiful patterns.